I have made a lot of scones in the almost-a-year that I've been here. These are adapted in method from Marion Cunningham's Buttermilk Scones in Baking with Julia, and I have messed with them a fair bit until I could get the process down for mornings when I'm extremely tired and not feeling remotely like being Donna Reedish and baking. And yeah, I could make the dough in advance and they aren't too bad if I do that, but to me the only reason they're worth all that butter is the way they taste when they're fresh. So: this week's list. Eleven steps for your weekend scones and some pictures from a couple of different batches. Blackberry scones, my personal faves and (in my opinion) the best ones for your first try. 2. Sunday morning, crawl out of bed, put on your slippers because your floor is cold, and give yourself whatever pep talk you require. If "scones in less than an hour" is not enough I probably can't help you. Ask your doctor or pharmacist. 4. Now stop being smug and get to work. In a large bowl, combine the flour, sugar if you're making fruit scones, baking powder, baking soda, and salt. Throw in optional zest (lemon if you're making blueberry or blackberry scones; orange if you're making cranberry scones). Mix well. Then using the large holes of a hand-held box grater, shred the cold butter directly into the dry ingredients. It will be tangled and unappealing-looking. Do not fear. It's just butter and it is your friend. Work the butter into the dry ingredients with your fingers, pulverizing the shreds until the whole bowlful looks crumbly. It's okay to leave some larger pieces of butter in the mix--it does lovely things to the texture. 6. When you've tossed your add-in with your crumbly flour, add 1 cup of cold buttermilk and combine it with your fingers. My 1-cup measure is on the large side, so I often have to add a bit more, a tablespoonful at a time, until almost all of the flour is absorbed into a very shaggy dough. Be kind of careful not to burst your berries any more than you have to. 7. Scatter a bit of flour on a work surface and pat half of the dough into a circle somewhere around half an inch thick. Using a large, non-serrated knife, cut the circle into six or eight triangles like you're slicing a pizza. These are rustic and sometimes your circles will not be precisely circular and you must not stress about this when your tunes are playing. Repeat with the other half of the dough. A somewhat circular round of yellow cheddar/green onion scone dough. I probably should have taken a pic when it was patted down a little thinner but this is what happens in early morning baking scenes. 8. Place the triangles on the prepared baking sheet, leaving an inch between each one. If you like, brush melted butter or buttermilk on top of each one, but I almost never bother because I'm singing along with Bangles b-sides and that is too fussy for me right now. Put the scones in the preheated oven and bake for 12-14 minutes. This pic is blurry but it is so important to me that you see how tall they get. This is why the butter is worth it. 11. Eat them while they're warm, with butter or jam or nothing but music or a book. Freeze extra scones wrapped tightly in foil for up to a week. The rest of your Sunday is ahead of you, most of your cleanup is done, and if you shared with anyone else they are lucky bastards. *You can add about as much in cranberries, blueberries, or cut-up strawberries--wash them and gently dry if they're fresh, and don't bother thawing if they're frozen. Crystallized ginger, rehydrated raisins, and a smidgen of chai-ish spices would be nice. You could add up to 2/3 cup of shredded sharp cheddar, some crumbled bacon, and chives. You might choose half a cup of blue cheese and hot smoked paprika. You might go with Swiss and sauteed mushrooms. One of you is probably thinking this is a good place to stick your leftover chicken korma, and you are probably wrong, but I don't want to step on your creativity. Make a few practice runs before going there, slugger. Cheese add-ins will probably require a bit more buttermilk, and you'll know better what the dough should feel like after you've made a few attempts. 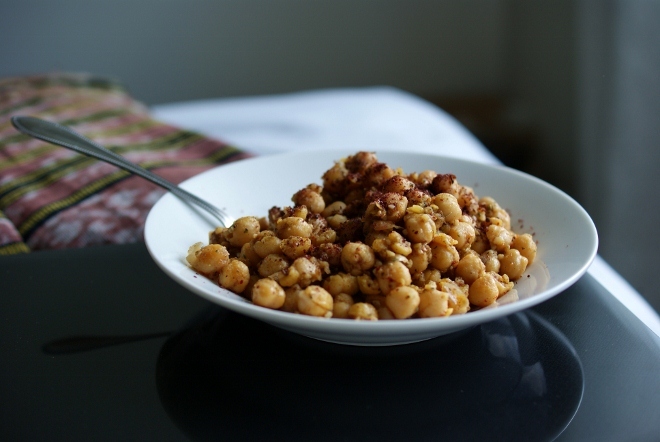 I make a gigantic quantity of chickpeas and black beans in the slow cooker because it is way cheaper than canned and uses vastly less salt. They also have flavor, unlike most canned beans, and they freeze perfectly. And then it is a matter of only minutes to scoop some into a pan with garlic and oil, heat them up, and toss them with anything in the world (today it was lemon juice, piment d’espelette, and za’atar sent straight from Roxanne when she was in Jerusalem), and a dusting of sumac once they were off the heat. You could squeeze a lemon wedge on top too, if you wanted. The leftovers are even good cold. A few minutes later and you’re back at work, but you didn’t hear that from me. One thing I’m looking forward to, once I move: growing my own tomatoes. New neighborhood has actual dirt and not construction fill in the yards! If I can manage to do this, I am fully prepared to live on nothing but tomatoes until the frost comes. Last year yellow tomatoes were my favorites; this year I crave the green ones. It’s summer, a time when home cooks want to enjoy the outdoors with our families and friends while taking advantage of the abundance of fresh fruits and vegetables available this time of year. I’ve been vegan for over three years and started down the path one day in May. If you’ve been considering a vegetarian or vegan diet, this is the best time of year to try a light and healthy meatless menu! When asked by those considering a vegan lifestyle, I say start simple. One of the biggest issues with preparing vegan meals can be the price of substitutes for animal based products. You don’t need them! With very few exceptions—Trader Joe’s soy chorizo being one, and it costs all of $1.99—you can eat balanced meals with ingredients primarily purchased at the supermarket with a little help in the pantry from your local health food store or the internet. After that recipe revamp came Compassionate Quiche, Peanut Butter Pie, and a tofu scramble that’s even better than scrambled eggs. Be patient, be inventive, but don’t give up! Adding vegan recipes to your repertoire is easier than you think, and there are lots of resources available to you. 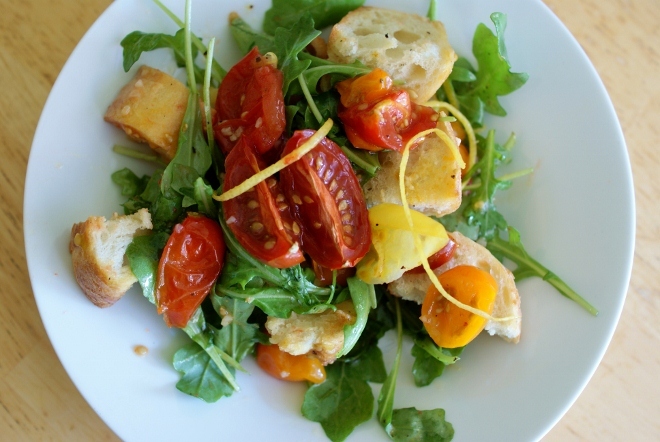 This month, why not try my Vegan Panzanella with either olive oil and lemon or Rum Herb Dressing? Make it ahead of time so you can get out of the kitchen and enjoy that backyard BBQ! A note from Kim: In case you had the same soaked-bread worries I had when I saw this recipe, fear not! The tomatoes give off a small amount of juice, and combined with Laura’s recommended lemon juice and oil, there’s JUST the right amount of dressing on the salad. The bread is incredible. Because it’s cut into large pieces, only the outside of it gets wet—not soggy in the least! You could write an entire book on the variations to the basic Panzanella recipe, but every one includes bread past its prime. If you don’t have any in the house, check out your local market or bakery for discounted loaves. They will work much better than fresh bread in this recipe! This side-view closeup is because I care about you. 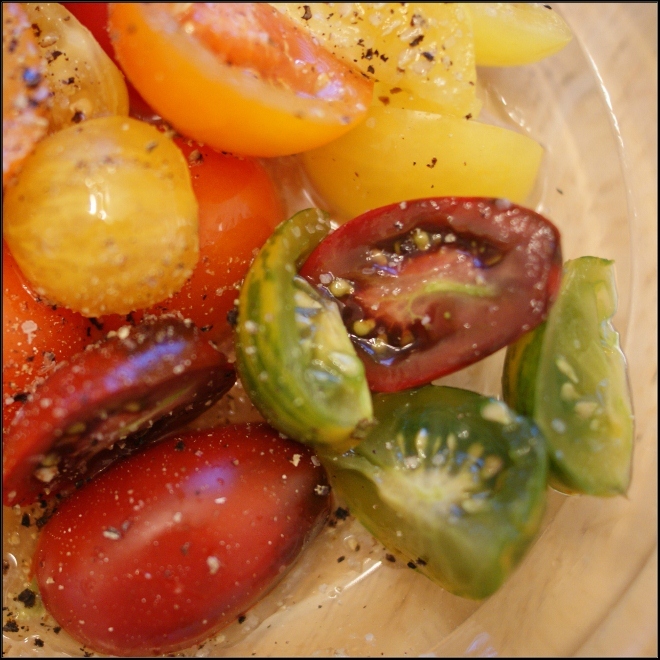 Also because I like my little multicolored tomato assortment. Also because it’s been an hour since I ate this salad and I kind of miss it.Preheat oven to 400°. Place bread on a baking sheet and tomatoes in a baking dish (great use of retro Corningware if you have it). Roast 10 minutes, check bread and tomatoes. Bread may toast faster than the tomatoes roast; remove bread when light brown and tomatoes when hot and tender but not mushy. Remove from oven and let cool until room temperature. Place arugula in a bowl. Toss with olive oil and garlic, then lemon juice and zest. Add bread and tomatoes then salt and pepper to taste. 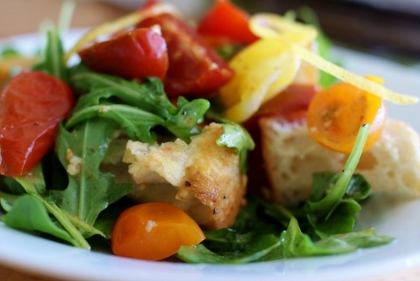 Serve at room temperatures –- makes a great hearty salad on a hot summer day! Variation: Substitute spinach and/or a variety of lettuce, add roasted red and yellow peppers, and top with the dressing below. Heat rum in small saucepan (don’t boil). Remove from heat and set on fire (this is fun but be careful). Let rum cool to room temperature then whisk with the rest of the ingredients. Chill for 1 hour before adding to Panzanella. *Check barnivore.com to ensure that your alcohol is also vegan. Laura Gesin is a vegan blogger and podcaster with a day job as a technology teacher at a high school in New Jersey. 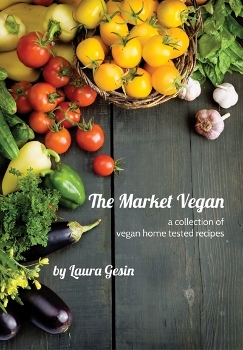 Earlier this month, Laura published a vegan digital cookbook entitled The Market Vegan which includes many family favorites updated for a healthier vegan lifestyle. More information about vegan cooking and the cookbook can be found at http://www.voxpopnj.com, and you can follow her on Twitter at @themarketvegan. Kim again: Thank you, Laura! Now, about that giveaway…. Just comment below with your favorite vegan food for a chance to win a copy of The Market Vegan (either pdf or epub versions are available). Anything animal-product free counts—even if it’s something you don’t have to cook at all, like a bowl of berries. The contest will close on Wednesday, July 11, at 11:59pm EDT.